Since the site in Middle Island has already been mined out above the water table, under the DEC permit a new 151-acre lake is being created to continue mining under water. While future permit applications may request modifications to the depth and size of the lake, the reclamation objective will remain a lake that will provide fishery habitat protected by a vegetated buffer around the lake. Now the tremendous reserves can be utilized and the mine’s life will be extended for up to 30 more years. Roanoke started the mining process years ago by using loaders and digging from the bank, feeding the material to a small group of portable screening plants and a main plant built sometime in the 1970’s. In 2000, when the company acquired a permit to mine underwater from the state’s Department of Environmental Conservation, they began the process of starting over with brand-new operations. Roanoke started looking for equipment to expand its operations and increase production. The search was not just for better, larger capacity equipment, but also for the development of an environmentally safe and efficient operation. Roanoke then made the decision to move from a dry processing operation to running their material through a wet process application. The Roanoke partners, along with 28 employees, had to invest in cutting edge equipment that has never been used before in the United States. It was a twin tank sand washing and classifying system driven by a single-computer-aided Aggre-Spec III process control unit. This machine allows re-blending of up to three products, including two spec products simultaneously. The Aggre-Spec III system replaced the manual system of hand calculations previously required to monitor and blend the right product mix with the old operation. They also purchased a state-of-the-art, totally electric DeGroot dredge, a new wash plant and a generation-to-power plant. Once the dredge picks up the material, it goes through a booster pump that pumps it about 1,500 feet to the plant. The plant has two 6x20 screens, two 12x48 classifying tanks and screws that fit each position. Behind the plant and dredge is a natural gas generation plant, three General Electric portable generators that supply power to the plant and to the dredge. Using electricity and natural gas keeps the operation very clean and very quiet. Environmentally they have strived to be good neighbors and have made it a number one priority to keep the mining operations environmentally clean. 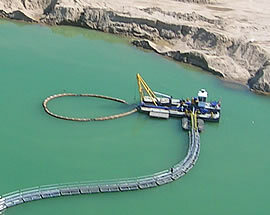 The entire operation, including the processing plant, dredge and power-generating plant are all environmentally sound. The all-electric suction dredge is safe from water contamination and the 3 MW generation plant runs on natural gas, allowing Roanoke Sand & Gravel to secure an air registration. When the New York state DOT visited the site, it was impressed with the operation and also with the operation plans submitted every year by the company. Roanoke is staying abreast of current options available in the industry. The Barker family runs Roanoke Sand & Gravel with business development as a goal, but knows how important it is to keep product advancements, the environment and the surrounding community in mind for long-term success.